The Be Still My Heart Valentine Bamboo is a unique way to send your love and win their heart this Valentine's Day! Known for its hardy, long-lasting green stems, this bamboo treat will be a constant symbol of your enduring love. 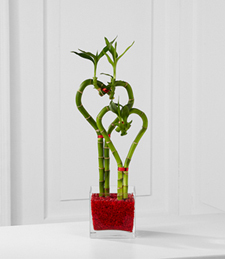 Four bamboo stalks stand entwined to create two perfect hearts arriving in a clear glass square container filled with red decorative rock, creating an exceptional Valentine's Day treat they will always cherish.